Have I ever mentioned that I LOVE the rain?! It’s been raining for a few days now, and oh boy, am I a happy camper. There’s nothing like a rainy day for sitting on the couch with a blanket and a cup of hot wassail (I promise I will post the recipe for this incredible Taylor family tradition soon), reading a good book and watching the fire. …and that, sadly, is exactly my train of thought every rainy morning when I stare at the alarm clock telling me that if I don’t get up right this instant I will never make it to work in time. I also probably think about that blanket and book ten times throughout the rest of the day (don’t try to pretend that you don’t too!). Last night the injustice of the situation got the best of me. In protest of the fact that the entirety of that gorgeous, rainy day was spent in the window-less abyss of my “office,” I had to make some good old-fashioned, rainy day comfort food. 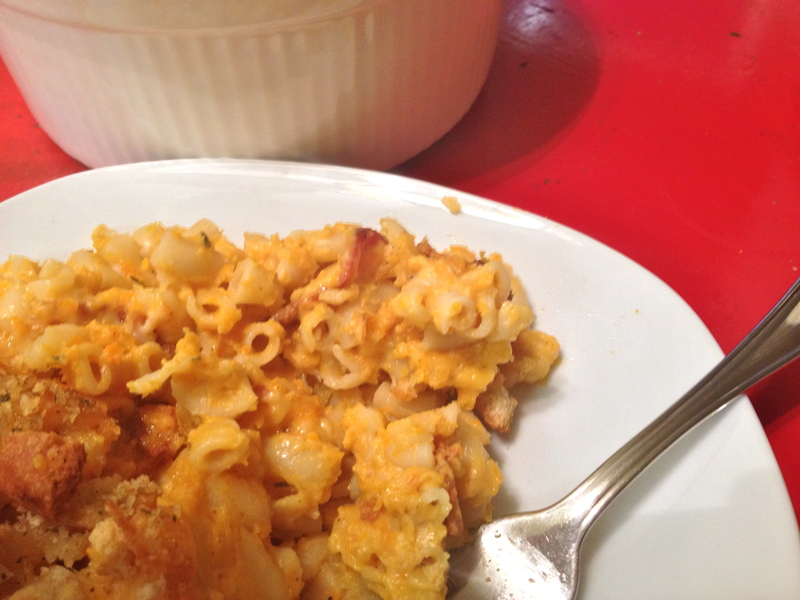 Classic mac n’ cheese takes a festive turn for the healthier in this amazing dish! Don’t feel like you are substituting butternut squash for the cheese, think of it as adding this flavorful squash to your already delicious tradition. The purpose of adding the squash is not (in my mind, anyway) to make it healthier, but to make it more delicious. And it just so happens to make it healthier! Everyone wins here! I recommend serving this with steamed veggies, soup and a great movie. Christmas, preferably. Preheat oven to 400F. 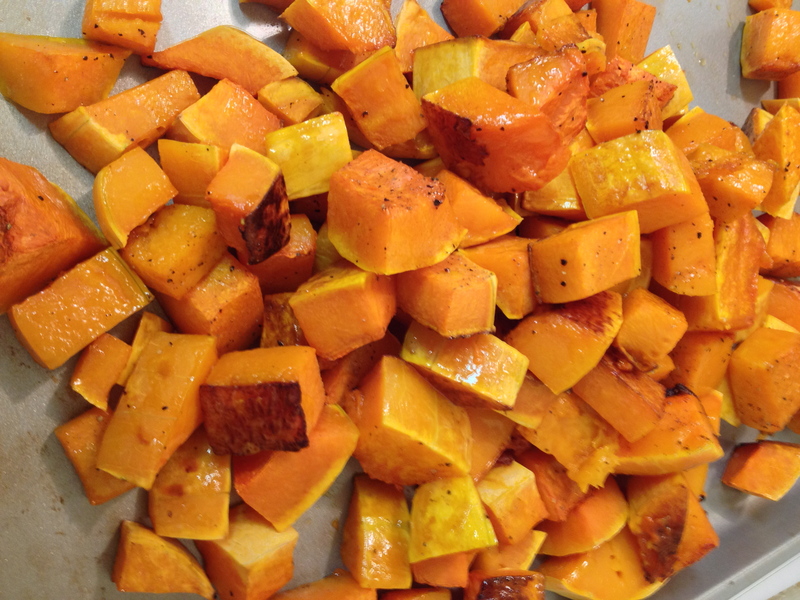 Toss olive oil, salt and pepper along with the butternut squash onto a cookie sheet. Bake for 30 minutes or until the squash is tender. Cook macaroni according to directions. Drain and set aside. Blend butternut squash in food processor until smooth. Add ½ cup milk and puree again. Cook the bacon, blot dry. In a large skillet over medium heat, add the butter. Once melted and slightly brown, add the flour. Whisk until incorporated, then whisk in the remaining milk. Add the nutmeg. Bring to a boil. Whisk until the sauce thickens, about 5 minutes. 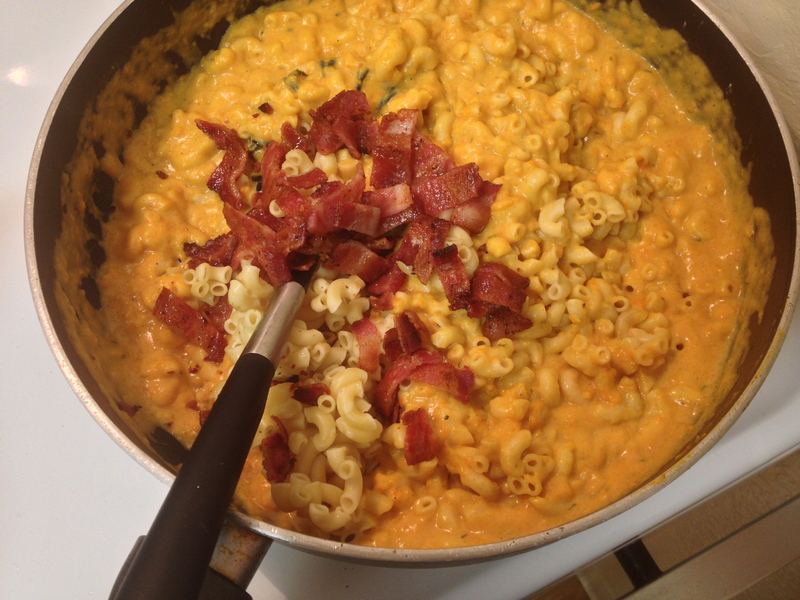 Add the butternut squash mixture, crumble half to ¾ of the bacon into the skillet, and stir to combine. Season to taste with salt and pepper. Once the macaroni is coated with the mixture, transfer half of the mixture to a greased 2 quart dish. I used a deep, round dish, but I would recommend something with more surface area. 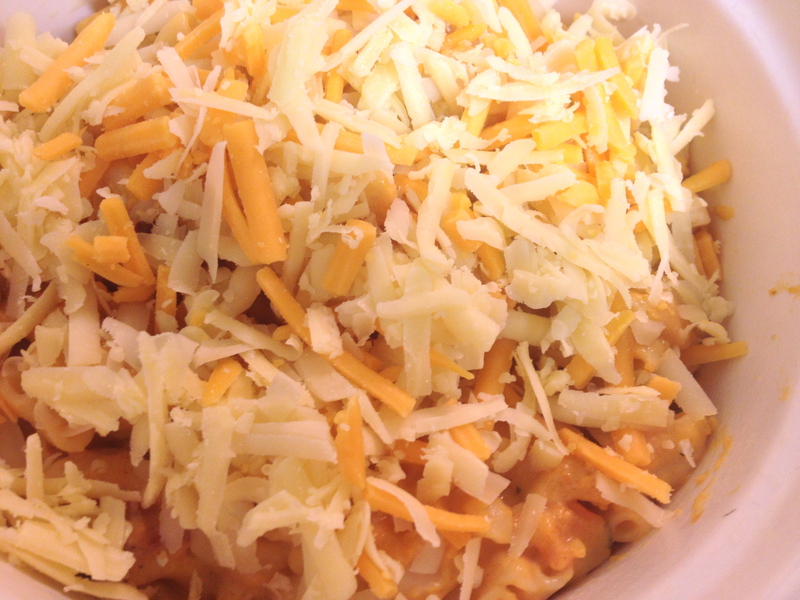 Sprinkle half of the cheeses over the top, add the remaining noodle mixture then sprinkle the rest of the cheese. 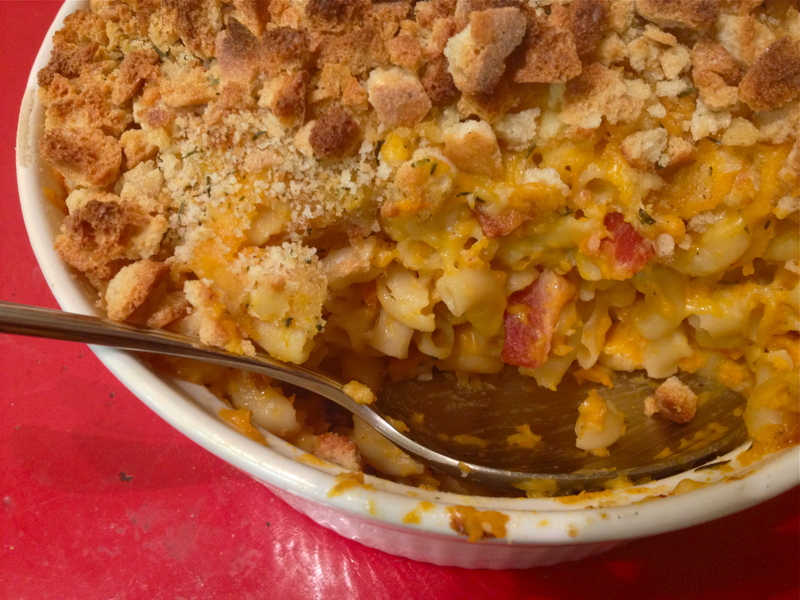 Sprinkle the top of the casserole with bread crumbs and the rest of the crumbled bacon. Bake for 20-30 minutes or until thoroughly heated and the cheese is melted and kind of crunchy.